Telemetry and Monitoring systems give a great visibility into what is going on with the resources and services in a data center. Applying machine learning and statistical analysis to this massive data source alone often leads to results where it becomes clear correlation ain’t causation. 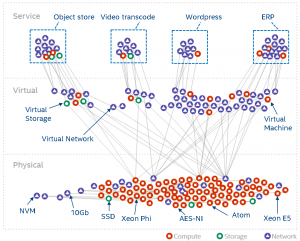 This brings the need for understanding of “what is connected to what” in a data center. By adding this topology as a data source, it is much easier to understand the relationships between two entities (e.g. a compute node and it’s Container/VM or a block storage and the NAS hosting it). We have therefore come up with a landscape graph model. The graph model captures all the entities in a data center/SDI and makes their relations explicit. 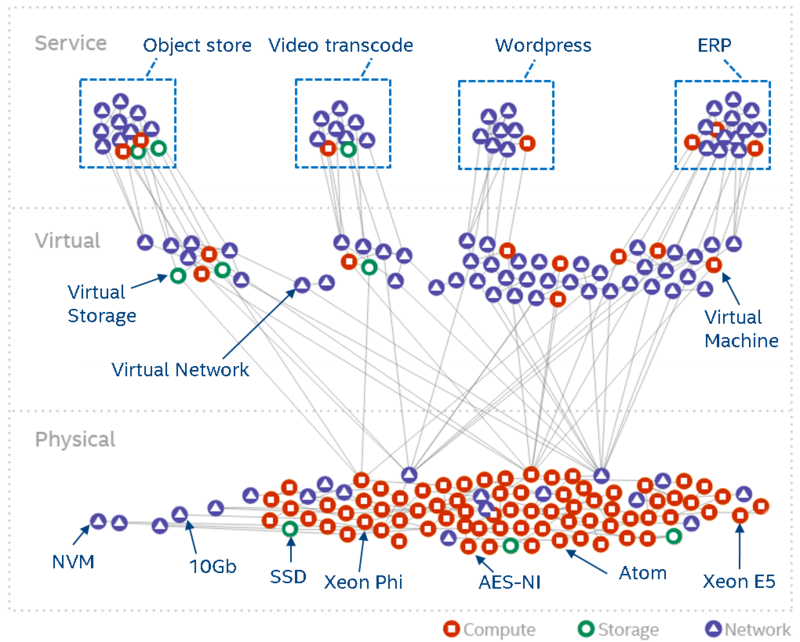 The following diagram shows the full-stack (from physical to virtual to service entities) landscape of a typical data center. 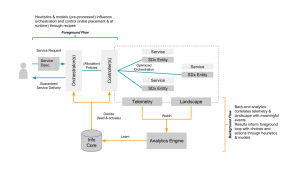 The graph model is automatically derived from systems such as OpenStack (or similar) and allow us to run all kinds of analytics – especially when we combine the graph model and annotate it with with data from telemetry systems. As one example use case for using the landscape and annotate it with telemetry data, this paper shows a way to colour the landscape for anomaly detection. Orchestration and Scheduling are not the newest topics, in fact they have been used in distributed systems forever (as in a couple of decades :-)). Systems like Mesos and Kubernetes (or offerings like Mantl) have brought advancements when it comes to dealing with scale. Other systems have a great background in scheduling and offer many (read a whole lot) policies for the same, this includes technologies like Grid Engine, LSF/OpenLava, etc.. Actually some of these technologies integrate with each other (like navops, Kubernetes and Mesos, OpenLava and Mesos, …), which makes it for example interesting when dealing with scheduling for space & order at the same time. Feedback control systems are a great start, however have some drawbacks. The larger the scale the more conflicts you might get between the feedback loops. The approaches might work up to rack level but probably not much beyond that. For large scale we need an approach which works along the lines of watch (e.g. by using snap), learn/decide (e.g. by using TAP) and act (See Jason Waxman’s keynote at OCP). This will eventually allow for a operatorless/humanless/driverless operations of the data center to support autonomous operations for scaling, healing and optimizing e.g. TCO. 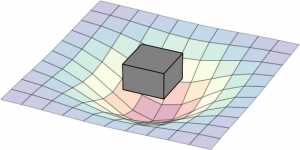 Within Intel Labs we have therefore come up with the concept of a foreground and a background flow. 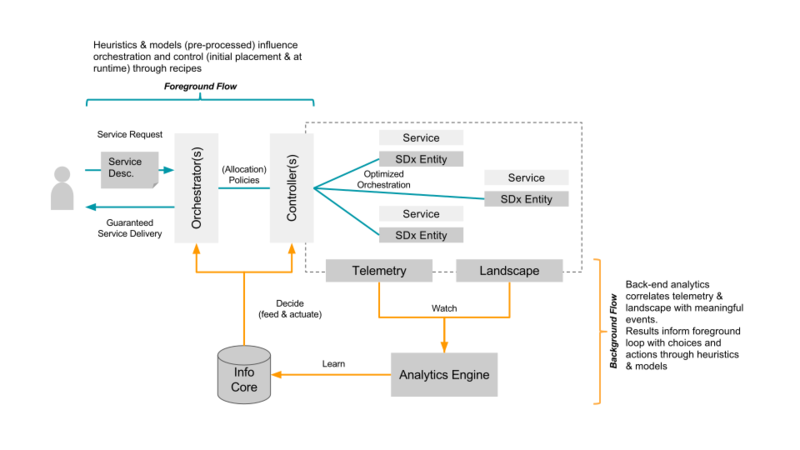 Within a continuously running background flow we observe (if needed over long time-periods) the data center with its resources and services and try to derive & update models heuristics (read: rule of thumb) continuously using analytics/machine learning. Within a foreground flow – which sometimes is denoted the fast loop as it needs to perform – we can than score against those heuristics/models in actions plans/recipes. The action plan/recipes describe a process on how we deal with a initial placement or re-balancing event. The scoring will allow for making better initial placement (adding a workload) as well as re-balancing decisions (how/what/when to kill, migrate or tune the infrastructure). How to derive an heuristics is explained in a paper referenced below – the example within that is about to learn how to best place a VNF so that is makes optimal use of platform features such as SR-IOV. Multiple other heuristics can easily be imagined, like learning how many cores a certain workload needs. The following diagram shows the background and foreground flow. I’ll follow-up with some more blog posts detailing certain aspects of our latest work/research, like how the landscape works.